“< an exact material imitation, with the intention to deceive or defraud >”. The artists reinterpret the term ‘counterfeit’ as an imitation of both physical and immaterial content. In this case, the term ‘counterfeit’ becomes a metaphor for the difficulty of identifying true from false; falsehoods necessarily having a basis in reality. COUNTERFEIT features Amelie Mckee and Ambar Quijano’s ‘Replicas of Bio-structures’ and series of photographs. They include pieces from the events: ‘Fossils of Today‘ and ‘The North Sea’s Extended Research Program Conference’. By intertwining both factual information and imagination, it becomes difficult to distinguish the true from the false, enabling different entry points into a complex story. Using a range of scientific and journalistic formats, the artworks further addresses the unclear boundaries between fact and fiction. 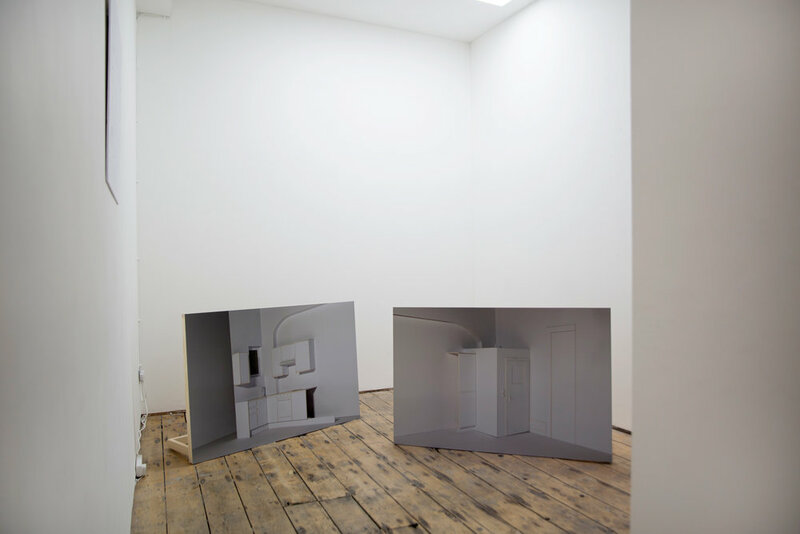 The exhibition further showcases Heyse Ip’s work, ‘Model Models’; a series of images re-photographing architectural models, mounted onto standing frames. These images bridge the photographic plane with the physical space it occupies. This creates the idea of the model as both the subject of the images and its physical arrangement. A minimal and empty presentation distorts the scale of these spaces. As a whole, the images question notions of representation through physical layering. Florentine Ruault’s presents a series of digital drawings that remove the cultural and stylistic features that characterize each city. The repetition of a geometric and colourful aesthetic refers to the cities’ homogenisation; a process that is currently increasing in many cities’ urban landscapes. The result is a graphic interpretation of the multiple cities, which become inseparable in the way they are depicted.